Originally, Craftsman was not just a style, but a way of life. Let’s go back….to the late 1800s. The industrial revolution is over; many things are made by machine now, especially furniture, though the furniture is still the same old style, just made faster – and more shoddily. Craftsmanship is pretty much gone out the window. People are sick of the industrial lifestyle – hard work in terrible conditions, economic and social conditions that are unsatisfactory. Feeling separated from nature. In England, William Morris, an artist and writer leads a movement away from these troubling conditions, ushering in the age of the Arts and Crafts movement, and furniture that is later called “Craftsman” or “Mission” style (for an explanation of the difference, see my blog post Craftsman, Mission, Arts and Crafts – Whats the difference?). The Arts and Crafts movement wasn’t just about furniture; it was about simplicity, wallpaper, home design; bringing in earthy tones and natural materials and simple man-made materials like wood, stone, tile, stained glass, animal figures and so on. It was an evolution – though going backward, in a sense. But this is a woodworking blog, so we’ll focus on that. Studying the craftsman style, one will see simple symmetrical pieces with only moderate embellishment (and even the embellishments were simple). Joinery is solid, lasting, simple – witness the mortise and tenon joint. Embellishments were as simple as an arch in a stretcher, all the way up to inlays of beautiful, though somewhat simple patterns of different colored woods, and even some metals such as pewter and copper. But why was this so? Again, it’s going back to the reason for the Arts and Crafts movement, and I think it’s worthing being aware of – especially today, when we have furniture atrocities in the manifestations of IKEA and home assembly fiber-board “furniture” from Wal-Mart, that has very little style, and certainly won’t last. No, what their philosophy was on the matter of furniture is quite insightful. Gustav Stickley, whom one could really call the father of Mission furniture (at least in America), felt that those things that we want to keep around us in are home (furniture) should be as carefully selected as our friends; they should have certain qualities and characteristics before we allow them into our heart and home. He felt that inanimate objects like furniture have their own honesty, characteristics and qualities as well. If they do their job – their designed purpose – in a way that is consistent, done well, and are attractive pieces – then they should be welcomed into our homes. Which makes sense, when you think about it – would you want an ugly, uncomfortable chair whose leg sometimes collapses in your home? I would hope not; though some people put up with it. These pieces, Stickley felt, then become like old friends, which only adds to the richness and comfort of your home. He addresses the craftsman (the person), saying, to paraphrase, that if he created a piece under duress, on an assembly line, with no passion, and no care for the creation, then the piece reflects that. However, if he has shown great passion in his work, and carried it out technically well, then the created piece will reflect that wonderful sentiment throughout it’s existence. In a sense, the craftsman breathes a soul into a piece. And it’s quite true. 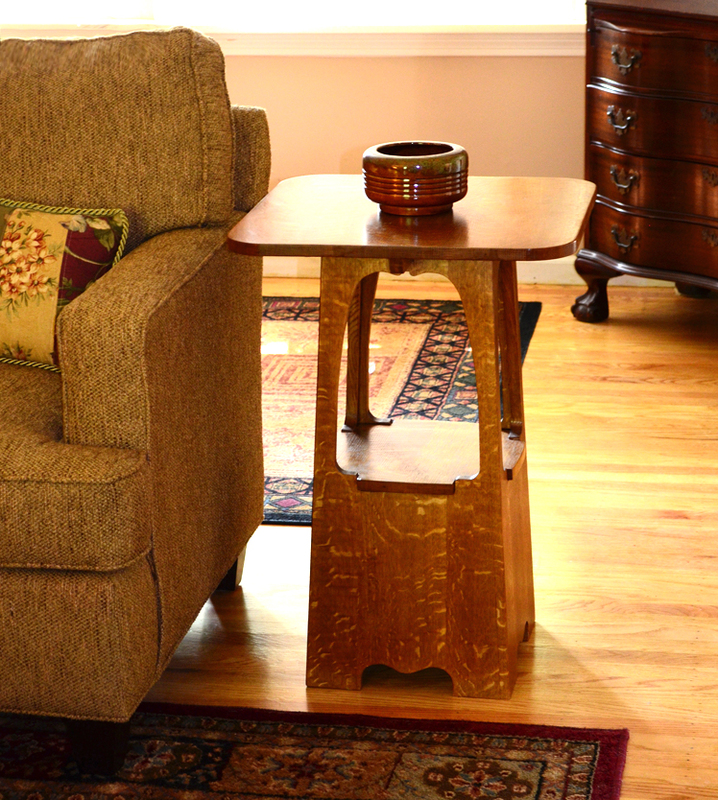 If you are a good woodworker, do you have pieces about your home that you made that really add to your life? Would you miss it if it was gone? I know I do. I have a beautiful coffee table I made, and sweated over, refinishing it three times, because I didn’t get the finish right; it was one of my first major projects, and I had quite a time with it. But it turned out wonderfully. It is solid and attractive, and perhaps one day, my kids will enjoy it as much as I do. Now, THAT is good woodworking.